Every business is driven by efficiency and profitability. The holy grail of any successful company is increasing productivity, thus increasing profits. One of very cost effective methods of increased productivity is by inspiring and motivating employees to perform better and achieve higher goals. Employee motivation is the cornerstone of every successful corporate recognition program. By properly recognizing and rewarding top performers, companies retain the top talent while boosting morale and desire to excel among peers. Majority of research and studies exhibit that employee satisfaction with their jobs a factor of strong desire to be acknowledged and recognized for a job well done. In other words, we all want a constant pat on a shoulder, a constant reminder of our hard work and competency. And what can be more permanent then a recognition trophy proudly and prominently displayed at the place of work, constantly reminding of your excellent performance. For every above mentioned category we have developed a beautiful collection of crystal awards that help communicate the message of gratitude and encouragement for further advancement. Employees that meet and exceed goals and objectives are often top performers, and it is appropriate to recognize them with crystal trophies that also symbolize peak or top. For example, our mountain collection of crystal awards is just perfect for top performers and it sends the right message of striving and achieving yet higher peaks f success. Also consider our stellar growth bar plaque, high point plaque, and stellar growth linear plaque. Outstanding Achievers are the cream of the crop in any organization, and they should be recognized and celebrated with really special awards and trophies. Our most exclusive Everest collection of crystal awards is ideal for celebrating outstanding achievements. Consider our above and beyond award, or ladder to success award, raise the bar award, conquer new heights award, top of the world award, summit to excellence award, soar high award, as the perfectly suited for recognition of outstanding achievements. Recognizing loyalty at a work place is also imperative to retaining corporate talent. Many companies choose to recognize such important career milestones as 5 years of service, 10, 15, 20, 25, 30 or more. 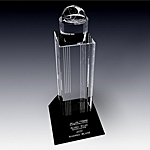 For "years of Service" awards we recommend the following popular pieces crystal pillar award, crystal book award, excellence circle award, merit award, agency plaque, prestige plaque. Retirement gifts and awards should be important and memorable and should communicate a message of gratitude and wishes of success in future personal and professional endeavors. Some companies choose to present a crystal vase as a parting retirement gift. In addition crystal clocks are very popular and timeless gifts, as well as the partnership award that features a crystal handshake for job well done. 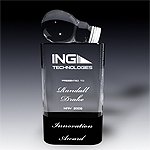 We designed and created a plethora of awards that celebrate promotion and career advancements. The following awards are ideal for celebrating promotions: spotlight award, personal growth award, soar high award, progress award, the ladder to success award. Research and development of new products and processes are essential to a successful future of most business establishments. Therefore, celebrating and recognizing those individuals who propel companies to the new heights by their vision, creativity and ingenuity is imperative. Brain capital should be most prized and cherished asset of any business. 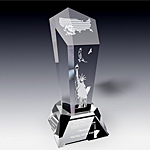 Here, at Crystal Art USA, we created a collection of crystal awards that are ideal tools of recognition for ingenuity, discovery or invention. Please consider the following crystal awards for your recognition program: the big idea award, Edison award, Magellan award, Da Vinci award, nova award. Each organization needs a road map to success. The road map includes milestones such as attainable steps such as goals and targets that a company has to meet within a certain time frame. Each milestone to corporate success should be celebrated by recognizing individuals and teams who contributed. 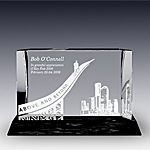 Hence we created a “Job Well Done” crystal award collection that celebrates milestone completion. This collection includes the following crystal awards: progress award, top of the world award, Summit to Excellence award, raise the bar award, crystal handshake award. While it is essential to recognize individuals for their personal accomplishments and achievements, it is also important to recognize teamwork and collaboration. A successful business collaboration is imperative to progress and prosperity of any organization. 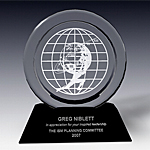 We offer a verity of sculptural crystal awards that are perfect for the teamwork recognition : synergy sphere award, teamwork award, partnership award, in-gear award, and working together award. It is important to recognize those who inspire others with their vision, who ignite hope, set the course and lead by example. Each ship needs a captain and each organization needs a leader who possesses integrity, competence, perseverance, and wisdom. Successful leadership should be recognized and commemorated. Many organizations owe their success to a few exceptional individuals with the vision to lead others to excellence. The following crystal awards are ideal for celebrating and recognizing leadership: conquer new heights award, Atlas award. 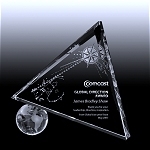 Deal awards or deal tombstones are quite popular tools of recognition within the financial and legal industries. 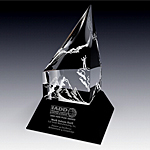 These crystal masterpieces are designed with a purpose of commemorating a deal or a new contract : summit to excellence award, synergy sphere award, red equilibrium award, high point plaque and vision plaque. Many companies strive to achieve top industry rating for their products and services. Receiving highest praise by consumers or independent industry organizations is not only an impressive accomplishment on its own by it certainly leads to increase in sales. Subsequently, each business wants to advertise high industry rating thus promoting corporate morale and increasing consumer confidence in their offerings. For example, car dealerships advertise cars that scored high in safety rating, real estate brokerage advertises top performing brokers, investment firm advertises top portfolio managers, etc. While recognizing a high industry rating a business might consider a crystal plaque that can be displayed in a prominent location of the business thus acting as a subtle advertisement to potential customers. We recommend the following plaques and awards: high point plaque, prestige plaque, legend octagon award, agency plaque, capstone crystal plaque, Apogee award, victory award. Participating and volunteering in corporate sponsored events such as team building events, educational seminars, or goal setting summits, sports and golf outings are important activities in developing corporate culture. Many individuals go well beyond their usual responsibilities to insure a success of such events, by helping with organization, logistics, supplies, volunteering to speak or present at the events. It is important to recognize such individuals for the set an excellent example to others. We offer the following crystal awards that help recognize volunteering at the workplace: majestic octagon award, excellence circle award, Cambridge plaque, crystal pillar award, crystal tower award. This article is written by Paula Gomberg. All content on this Web site is copyrighted as a collective work under the US copyright laws, and Crystal Art USA owns the copyright to the selection, coordination, arrangement, and enhancement of the content. In addition, the artwork and illustrations contained throughout the pages of this Web site are protected by copyright and may not be copied or otherwise reproduced without written permission.